The 29th national age-group swimming competition has begun on Friday at Syed Nazrul Islam Swimming complex in Mirpur in the city. 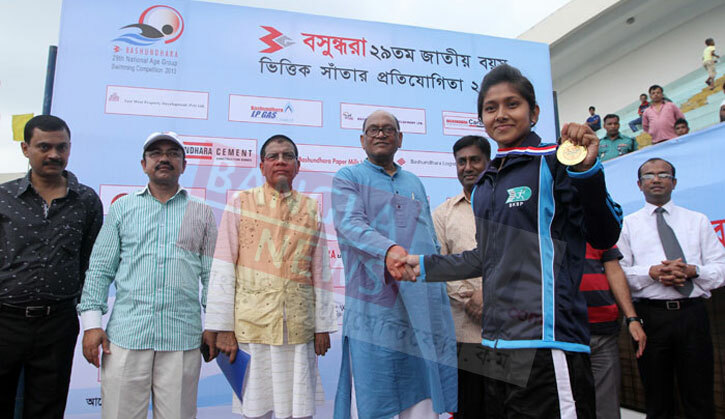 The three-day-long competition was organized by Bangladesh Swimming Federation and patronized by country`s leading business conglomerate Bashundhara group. State Minister for Liberation War Affairs Captain (rtd) Tajul Islam inaugurated the tournament at around 9:00am. Captain AB Tazul Islam as a chief guest thanked Bashundhara group and said that 29th national swimming competition is going on with the assistance of the group. Meanwhile, he urged sports affairs ministry to enrich and accelerate the swimming competition. Swimming federation president, also naval chief Admiral M Farid among others were present in the opening ceremony. Swimmers will compete in five age groups of Under-10, 11-12, 13-14, 15-17 and 18-20. Amongst 100 events, three are diving events. Due to lack of diving spring board in Mirpur Swimming Complex, the events will be held at BKSP diving pool. Winners of every event will get gold, silver and bronze medals. Meanwhile, the winning team will get a champion trophy and the highest medal receiver will be given a special trophy. 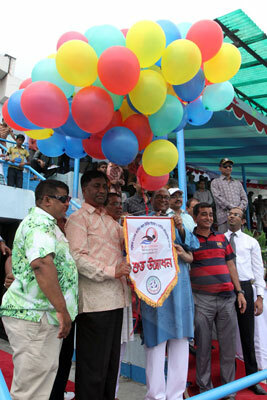 Besides, Bashundhara group will award the swimmers who will break national level records. Amongst the total Tk16 lakhs budget of the tournament, Bashundhara group provided Tk10 lakhs. About 500 promising swimmers from 60 teams including 28 districts sports agencies, 32 swimming clubs, BKSP and Bangladesh Ansar will compete in the tournament. On September 29, federation president will distribute the prizes among the winners. Bashundhara group representative Lieutenant Colonel (rtd) Khandakar Abdul Wahid will present as special guest in the prize giving ceremony.